The Kenoh stuff is a work. The new owners could still change stuff around if it's not meeting expectations. - Giant Baba Memorial Battle Royal: Kim Duk, Mitsuo Momota, Tsuyoshi Kikuchi, Masao Orihara, Masahito Kakihara, Masao Inoue, MEN's Teioh, Tamon Honda, Yuto Aijima, TARU, Ryuji Hijikata, etc. It seems very likely Tanahashi and Honma will tag against Sekimoto and Miyahara, which is primarily interesting to me because the fall guy there feels obvious enough we might not get a draw. If my math isn't wrong that leaves Hashimoto without opponent? It used to be black. Still horrible looking. NOAH's new owners want to increase the big matches. They also want to become the number 2 fed in Japan eventually. Talks of a new system will be in place, new image. I'm hoping for a streaming service. Although it'll have the same problem AJPW.tv does with the missing archive. Hell, NTV should launch a wrestling service. They would be allowed to use old footage for possible NOAH service, even from AJPW and JWA if they do get permission. I'm more interested in the changes. Hiroshi Tanahashi , Tomoaki Honma , Kento Miyahara , Daisuke Sekimoto , Naomichi Marufuji , Kazushi Miyamoto, Tomohiko Hashimoto have no matches announced yet. If you want to be conspiratorial, Chris Charlton has retweeted this and several of KENTA’s... which may be nothing, but he only really posts about New Japan. So. I guess what I’m saying is KENTA is back and Shibata is cleared and TAKEOVER is going to... well, it’s in the name. Or maybe he’ll do the freelance thing I mentioned earlier. Or just go back to NOAH. Either Kaito's new rival in NOAH. Or in the Junior division if he goes to NJPW. I did a search on here and didn't find a discussion on this. If it's been talked to death about, then my bad. Any recommendations on books of the history of Japanese Wrestling? Around the time of JWA and covering the split. EDIT: Damn it, there's a whole thread on wrestling books. I'm full of shame. EDITEDIT: To make this not a wasted post...uh... Favorite Bison Smith in NOAH match? Adding Kenta to BotSJ line-up would probably sell some tickets for that Sumo Hall finals between him and Hiromu. And I'm sure that NOAH fans would love Hiromu beating Kenta in the finals and Ishimori in Dominion. On the other hand him going back to NOAH would help them a lot. Either way fun times ahead. -Maybe he feels loyal to NOAH; maybe it's too different from the company he left; maybe new ownership will pay well and he finds it a secure landing; maybe he really likes the idea of being presented as a heavyweight again, which NOAH likely would do. -New Japan, on the other hand, would pay better, just lost KUSHIDA to NXT and Ospreay to heavyweight, and generally needs someone who will kick people rudely. KENTA did also just tweet that he loved ROH, and New Japan now has that relationship. -Honestly, I think All Japan could use him more than either, since their junior ranks are pretty barren and they lack many credible TC challengers; but unless he's really close with Akiyama, I can't see it being attractive to him. Still, the numerous options are why I'd prefer to see him go the freelance route, thus leaving all of them open. I'd bet New Japan gets him though, if I had to choose. This is going to be tricky. On one hand, if the promotion is ever going to grow it needs to get out of Misawa's shadow; on the other, that's a big shadow. If nothing else I hope this means Kaito gets a gimmick beyond "really really likes Misawa." While All Japan could use him I don't see him going there, if he is okay with being junior then only NJPW really makes sense I think. As for getting out of Misawa's shadow, I actually don't want it to happen. I always found it fascinating how Misawa was slowly turning into mythological figure. And I'm not sure if it really caused them problems with growth. It's to move past well from the past. They're never going to be the escalation pro wrestling fed they once were. I think they're retaining everything else. Has Shingo done anything of note since joining NJ? I know he won the junior belts, but I’ve seen zero fanfare. Well there is nothing else for him to do, but to defend tag titles and wait for BotSJ. 1. CARBELL PRESENTS: Takao Omori & Carbell Ito besiegen Yuma Aoyagi & Yusuke Okada (10:14) nach einem Axe Bomber von Omori gegen Okada. 2. WRESTLE-1 Offer Match: Kaz Hayashi besiegt Alejandro (9:58) mit dem Final Cut. 3. UNPREDICTABLE WORLD: Mitsuya Nagai & Raijin Yaguchi vs. TAJIRI & Daisuke Sekimoto - Double DQ (15:11), als Nagai & TAJIRI den Referee mit Poison Mist besprühten. 4. 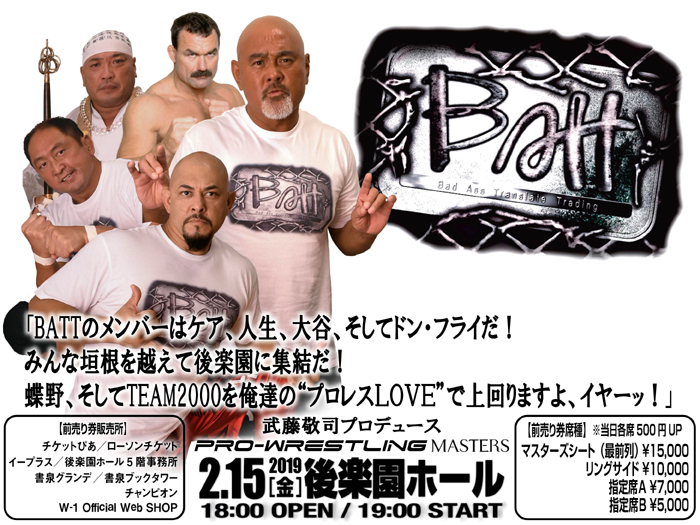 THE ART OF BATTLE: Tatsumi Fujinami , Kohei Sato & Go Shiozaki besiegen NOSAWA Rongai, MADAZA & KAZMA SAKAMOTO (14:40) nach einem Dragon Sleeper von Fujinami gegen NOSAWA. 5. HEISEI SAMURAI SPIRITS: Shiro Koshinaka, AKIRA, Masashi Aoyagi, Akitoshi Saito & X = Kengo Mashimo w/ Great Kabuki besiegen Daichi Hashimoto, Tetsuya Endo , Shotaro Ashino , Kyu Mogami & Kaito Kiyomiya (25:15) nach einem Vertical-Drop Brainbuster von Mashimo gegen Mogami. D.Z is a work......of art. Won't be surprised if he'll join R3K on his return and be their fall guy. From what I thought I understood, Kawato was pretty awful at first, particularly being very unsafe in terms of missing catches, but had been doing slightly better in the last few months. Or maybe he's just been pushed down the card, I don't know, I haven't had real TV in awhile and am way out of the CMLL loop.